The sexual allure of Anne Boleyn has gripped both Henry VIII and the Spanish ambassador, Don Gómez de Feria. However, only one man can triumph and he will set aside a loyal, faithful Queen and trigger the Reformation in the process. Here are four great characters: Anne, fearful yet ambitious, Queen Catherine, loving but desperate to retain her position, Gómez enthralled against his better judgement – and bestriding the English Court, the all-powerful Henry, bewitched, determined and callous. 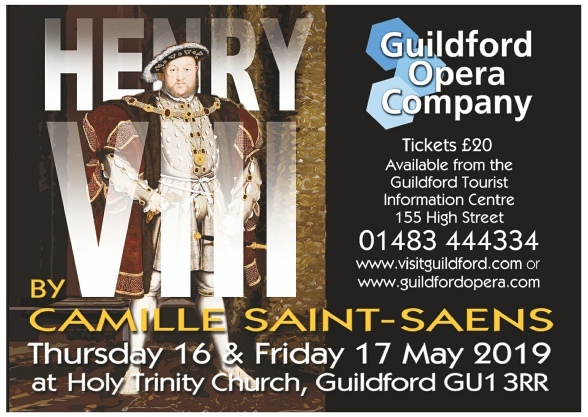 A great success internationally in the late 19th century, Henry VIII combines scenes of intimate psychological drama with wonderful set pieces, not least the climax when Henry overthrows the decision of the Papal Legate and declares himself Head of a Church of England. 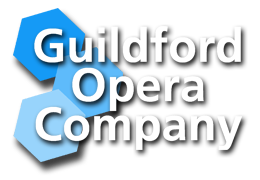 This is a rare opportunity to see a work by a composer most popular for Carnival of the Animals; but anyone familiar with Samson and Delilah will know what to expect musically. Saint-Saëns spent time in England before writing the opera and here are wonderful melodies with hints of old English tunes and early Renaissance style contrasted with powerful dramatic choruses. The production is fully staged with period costumes, piano accompaniment, and sung in English with surtitles. The setting in Guildford’s Holy Trinity Church represents the Palaces of Whitehall and Richmond, as well as Westminster Hall, and could not be more appropriate. the Guildford Tourist Information Centre. Please note that the seats in The Holy Trinity are not numbered, and that the previous very firm wooden seating has been replaced with comfortable padded seating.